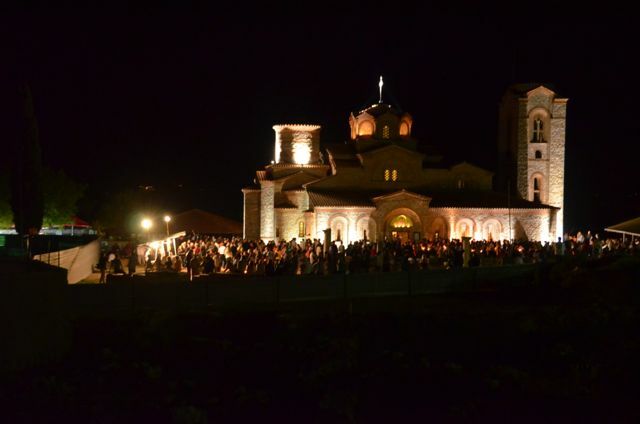 On Easter Eve, this past Saturday, we joined a procession of thousands of Macedonians to the nearby Saint Panteleimon Church, which was only recently renovated using the original materials which were still on site. The church sits on the grounds of one of Europe’s oldest universities; in fact, the Cyrillic alphabet was developed at the learning institution that was previously here. 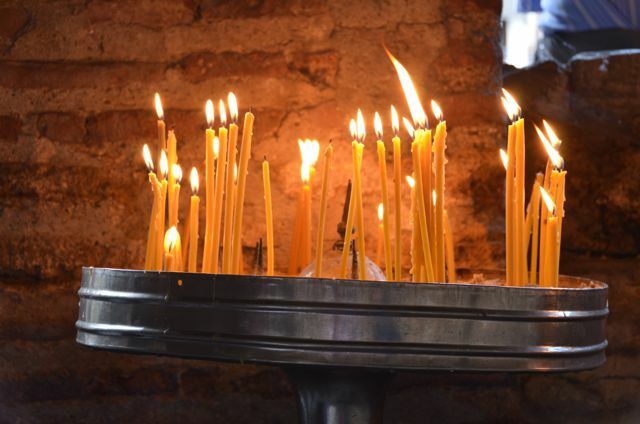 In anticipation of the massive crowds that would be passing through the neighborhood to the church, small, family-run stands had cropped up to sell candles. 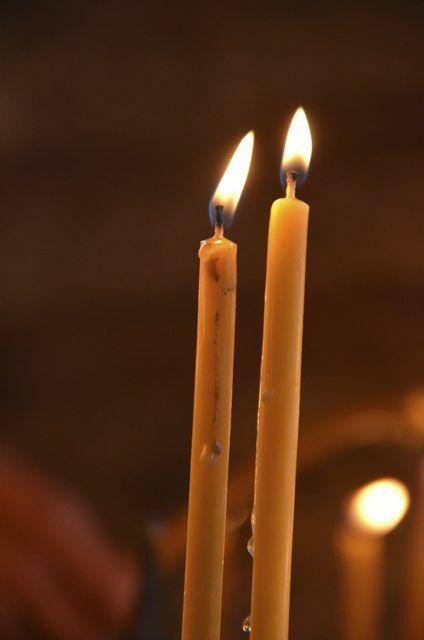 We purchased two slender beeswax candles from young girls, while noting that it was a different spin of sorts on the American lemonade stand tradition. 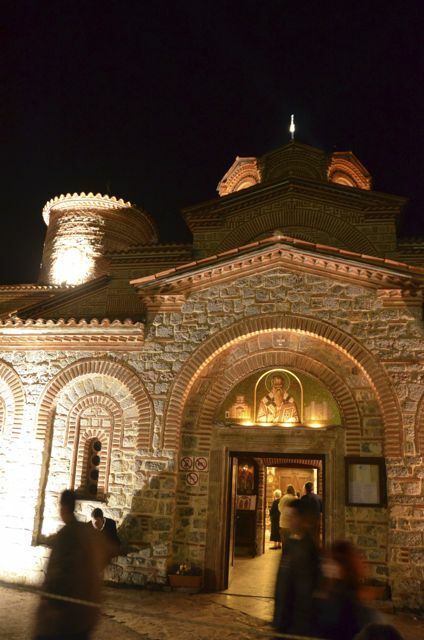 Saint Panteleimon Church was dramatically illuminated for the occasion, showcasing its elegant mosaics and beautiful brickwork. Our arrival around 11:15 p.m. couldn’t have been better timed, for when we stopped into the church’s small interior, expecting only to see pre-mass preparations, we actually got to participate in the entire ceremony (while thousands of others listened to the projections outside). 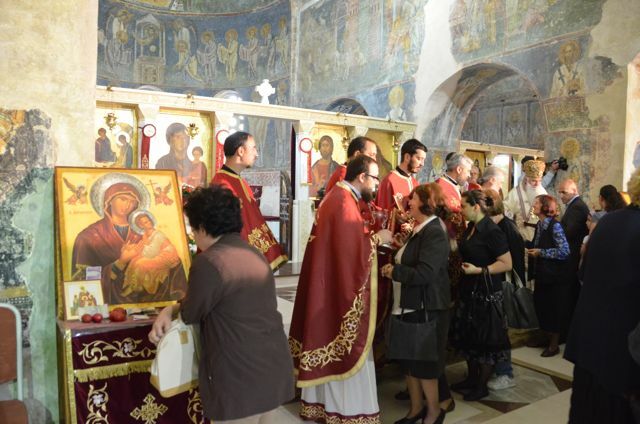 Upon entering the church, Orthodox Christians kissed the icons of the saints, then deposited a banknote or coins into the slot underneath the ornate images. A bishop and his deacons filled the air with song and the rich aroma of incense, as participants looked on with candles in hand. At one point, we were all led outside the church. It was dark as the doors were locked and the ceremony continued outside. 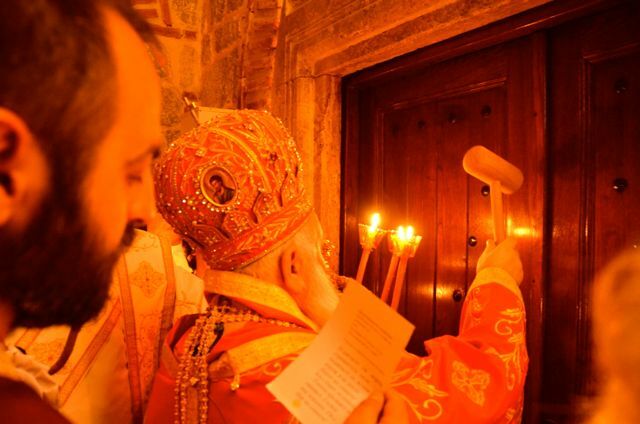 Shortly thereafter, the bishop returned with a wooden hammer in hand, knocking three times, and symbolizing Jesus’ resurrection. 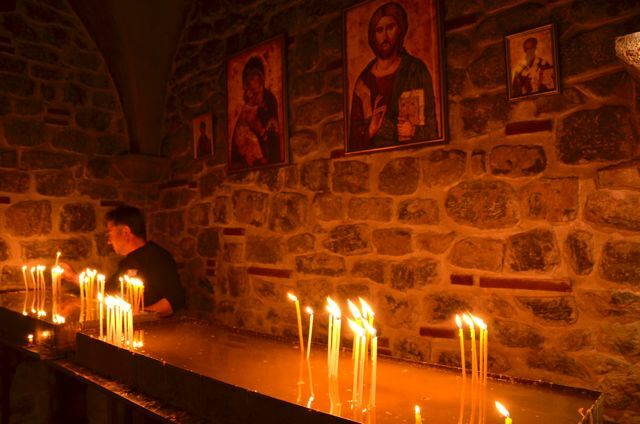 The Macedonian people sang joyously outside and again we were ushered inside. The next day, we were graciously invited to our apartment owner’s home for Easter dinner of lamb, roasted potatoes, Macedonian salad (cucumbers, tomatoes, feta cheese and onions), and fresh-baked bread. Traditional Macedonian music with accordion overtones played, and one of our new friends gave us our first Cyrillic alphabet lesson from a family picture book. Since the mass they traditionally attend every year was set to commence at the nearby St. Sophia Church, the family decided to do a progressive dinner. Shawn would have to wait to feast upon the massive tray of homemade baklava that had been tempting him since our arrival. 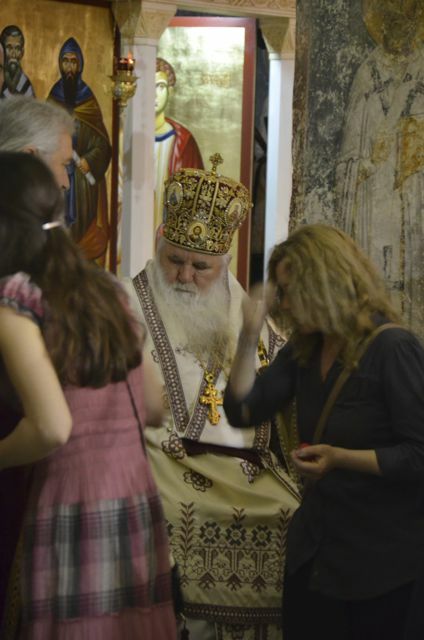 Though Saint Panteleim’s interior on Easter Eve was magnificent, St. Sophia’s offered a vastly different ambience. 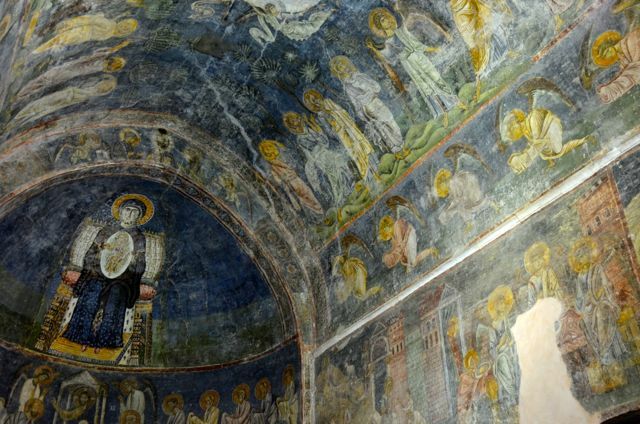 One thousand year-old frescoes with a rich navy blue background still adorned the ancient walls. 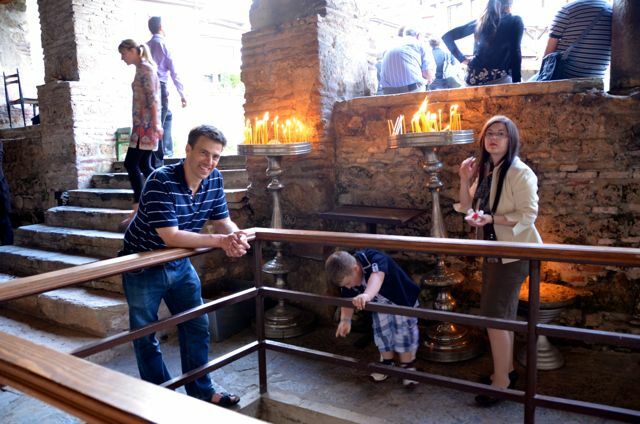 The church is thought to have been built in either the ninth or tenth century. The same bishop and clergy who’d presided over the services the night before had changed arenas and were now leading the late afternoon ceremony. 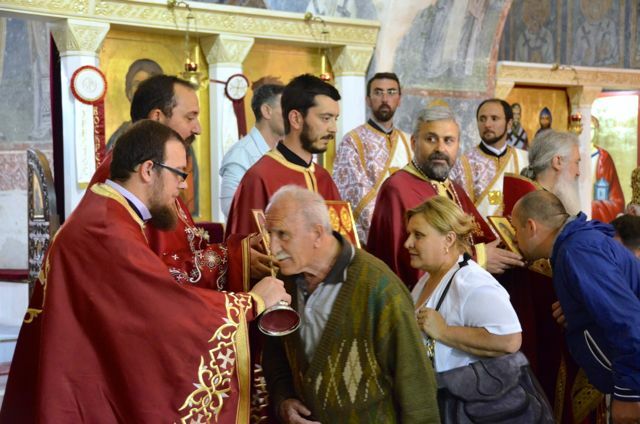 It culminated in the congregation participating in a procession that allowed them to kiss icons and crosses that the priests were holding. 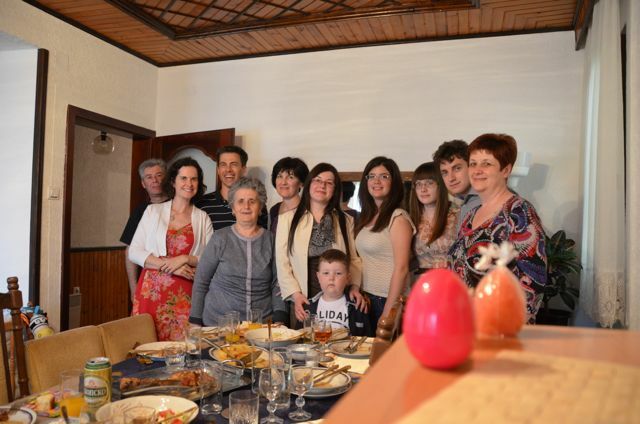 Children were also given red Easter eggs, which are customary in Macedonia and symbolize life and rebirth. 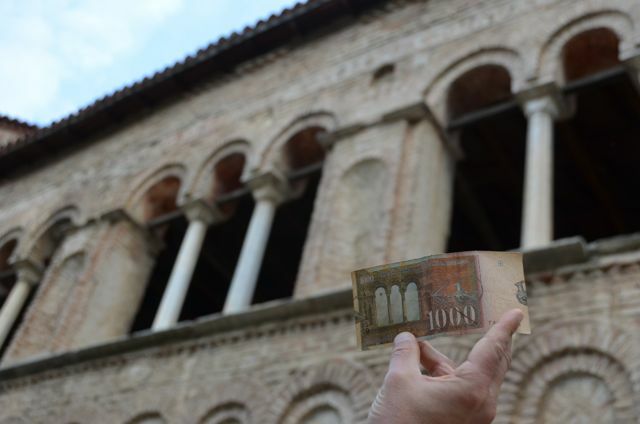 Saint Sophia’s architecture inspired the art for the 1000 Denar banknote. Returning to the family’s home, it was time for dessert. 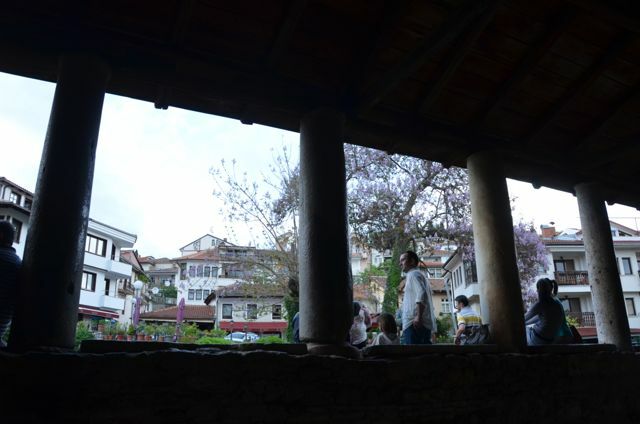 The family and Shawn feasted upon the baklava, as well as a fruit cake infused with kiwi, bananas and strawberries, all rounded off with rich, Turkish-style coffee. Not wanting to leave me out of the party, I was treated to gluten-free ice-cream, ending the special day with a sweet finish. We shall forever remember our new Macedonian friend’s warm hospitality. The joke is that we’ll host each other for our respective Christmas celebrations next year. 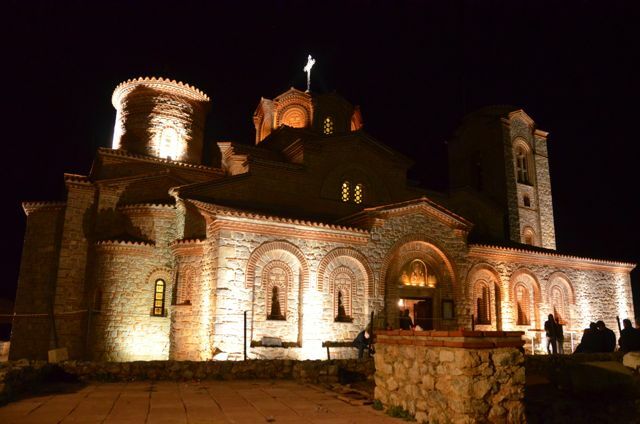 Are you looking for accommodation in the heart of Ohrid’s Old Town? Shawn and I spent two weeks at the Svetlana Guesthouse (affiliate link), run by the family featured in this post. The location was fantastic, as it was about 100 meters to Ohrid’s Ancient Theater, and roughly 200 meters from Samoil’s Fortress. We loved having our own balcony, as well as access to a communal kitchen when we wanted to cook. 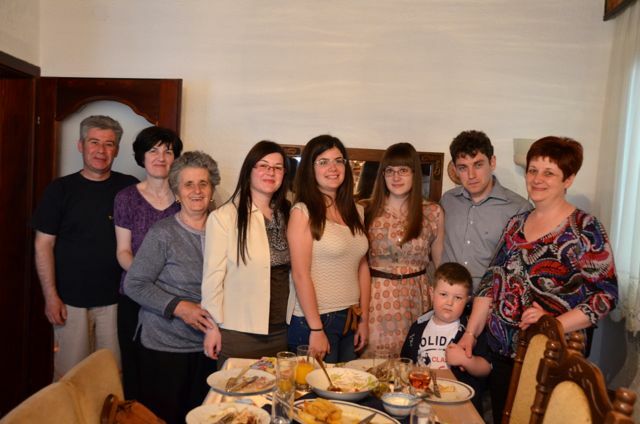 Svetlana, her children, and grandchildren made our stay in Ohrid extra special. We’ve indeed been lucky to have been so warmly welcomed by this family, Madhu. 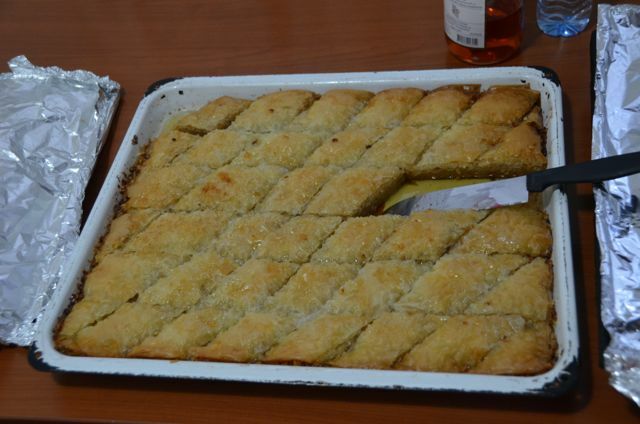 Regarding the baklava, Shawn had to be my tastebuds since it’s laden with gluten, but I hear that it was divine! It was drippy with honey goodness. Must have been a very moving experience. Terrific photos and commentary on this event. It was, Phil, especially as I imagined how that spot has been so special for hundreds of years. 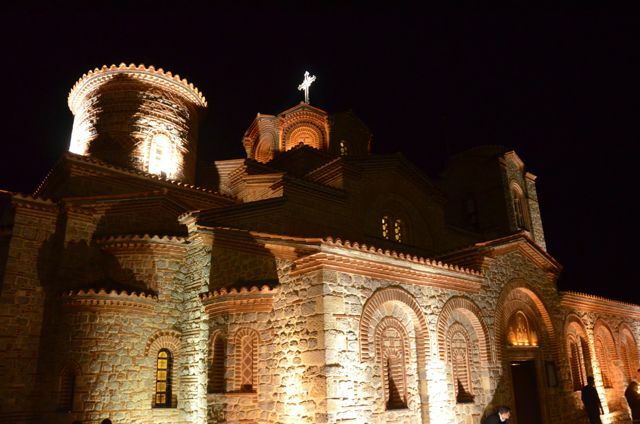 We were fortunate to be in Ohrid during Orthodox Easter celebrations. 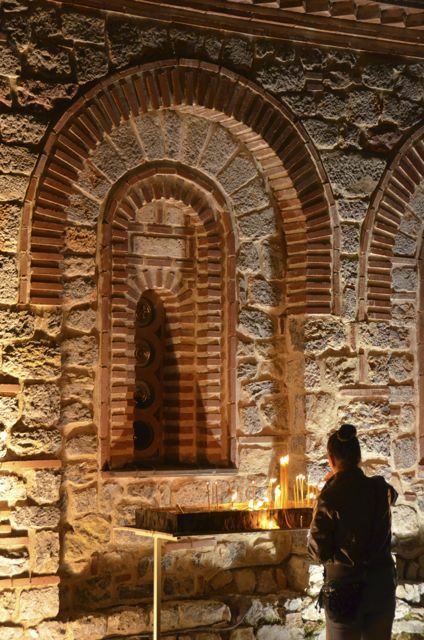 How wonderful to know that these ancient traditions are still part of the way of life in this corner of the world… and what traditions, spirit, music, architecture, food, family, it sounds like the experience of a life-time…. Valerie, it was an unexpected, sweet surprise. 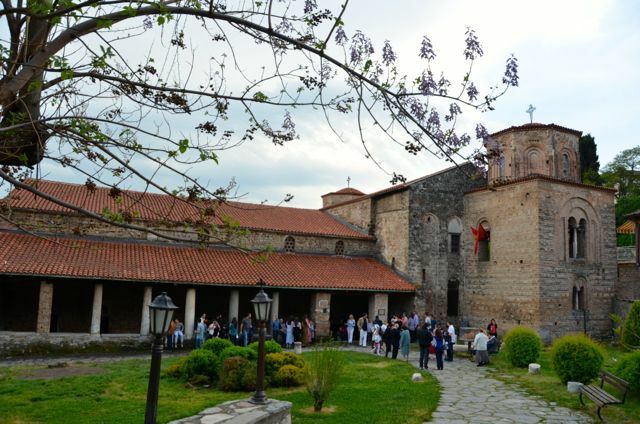 We’d forgotten about the Orthodox Easter celebrations when we were initially planning our trip to Ohrid, then decided to stay a bit longer so that we could experience the festivities. So glad we did! How lovely that you were invited to spend this special time with your new friends. I loved reading about the Easter celebrations. 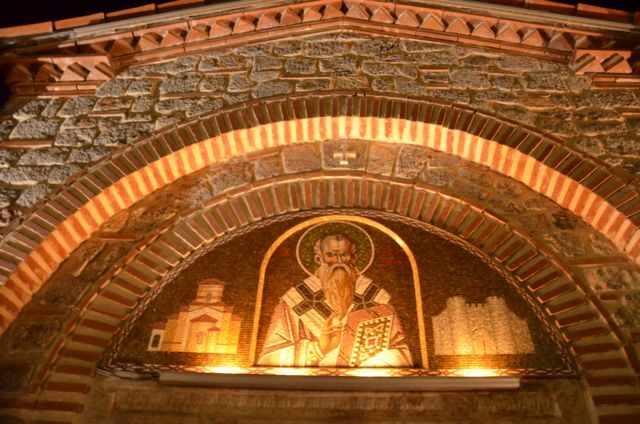 The frescoes in St Sophia’s looked so beautiful. 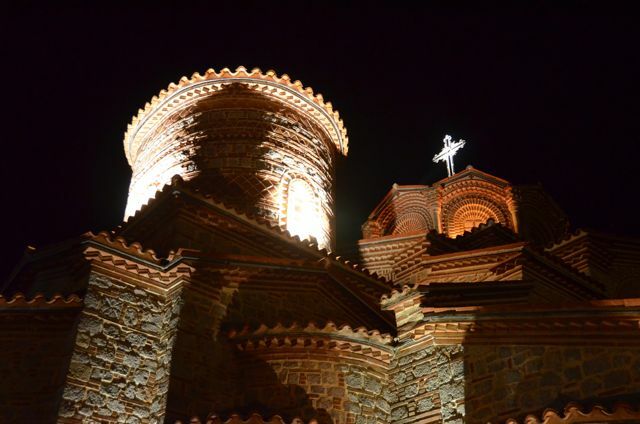 The more I read about Ohrid, the more I am tempted to follow in your footsteps! 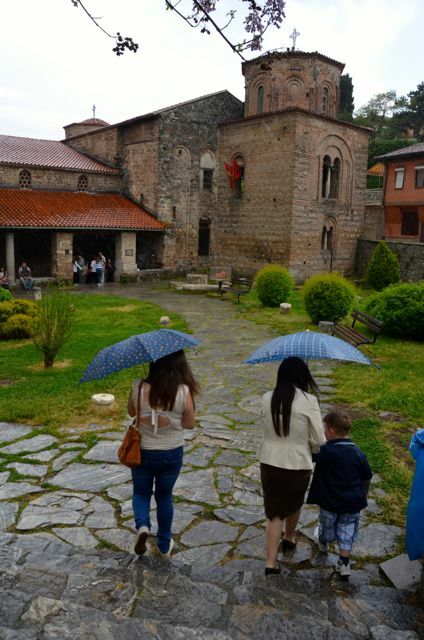 Jenny, in the weeks before we visited Ohrid, the city had been popping up on my travel radar – largely because of other travel bloggers and magazines. It’s one of those places that I’m surprised I hadn’t heard much about until now. Really a gem, and if you come, I can recommend the family guesthouse where we stayed. Such friendly owners. 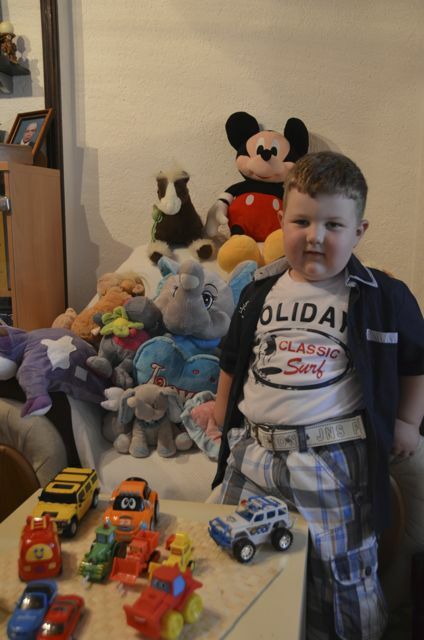 That’s a special story with lovely photos. Glad you enjoyed it, Carol! 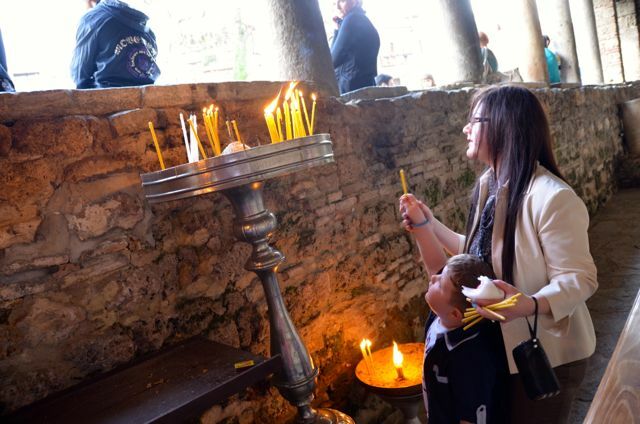 Since Ohrid is known for its spiritual connection, we were really lucky to be here for such an important holiday. Easter really made the city come alive. Thank you, Gerard. I probably should’ve brought a tripod with for those night shots, but wanted to keep my hands free to hold a candle and fully enjoy the evening. What a wonderful day for you! I love how many people in other countries welcome “outsiders” to share their lives and special days. There are Russian Orthodox Churches here on the Kenai Peninsula, Alaska, and a good friend attends one of them. 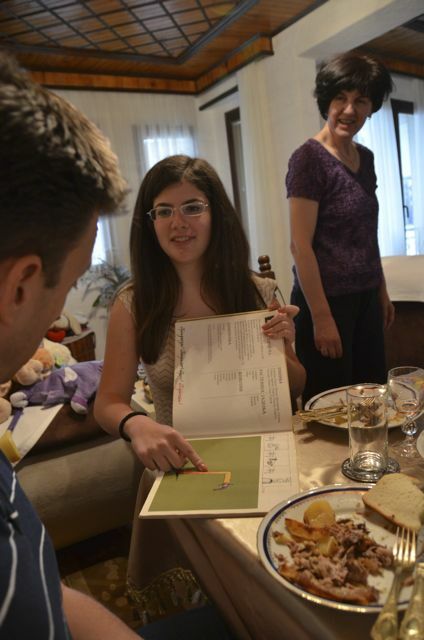 We always enjoy Easter dinner with them, but of course the menu is quite different. Marilyn, as I’ve travelled the world and been so warmly welcomed in diverse spots, I always wonder how I can give back in some way. Perhaps that will have to wait until we settle down a bit, but it’s definitely moments like these that make travel so meaningful. It’s fun that you regularly celebrate Easter with your friends. What does their menu consist of? 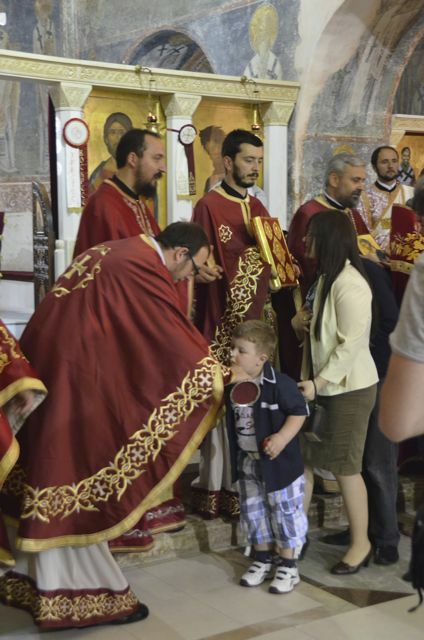 I wonder how close the church traditions are to what we observed here. Tricia, what a wonderful and spiritual experience for both of you, it kind of moved me going through your images and seeing people so devoted in their faith. Though a photographers challenge taking pictures @ night and as well other very different light conditions, you did a wonderful job. Thank you for sharing your great journey. Cornelia, I also felt quite moved during both events, especially when I considered that people have been participating in similar celebrations there for nearly 1,000 years. As an accomplished photographer, I appreciate your nice feedback about my night shots. I really should’ve brought our tripod along for optimal images, but carrying it around can be so cumbersome at times. Very nice Tricia, thanks for sharing, double Easter eggs, like it. Glad you enjoyed, Mark! I thought it was fitting that the Easter eggs made it into the image too. Gorgeous photos. I’ve never spent too much time thinking about Macedonia, and wrongfully so I admit. Some of the churches, especially the hand-painted insides, look interesting. You’ve opened me up to a new little world. Thanks Tricia! Nina, the world is quite small and at the same time, quite large. As we travel, I just realize how much there is to learn and see. Such is the joy of traveling! I’m glad you took away a few tidbits about this special part of the world.